The results of Colombia’s May 27 presidential election confirmed that a run-off election between Gustavo Petro and Ivan Duque will be required to decide the country’s newest leader. The election is set for June 17. Ivan Duque, former president Alvaro Uribe's protégée and candidate for the right-wing Grand Alliance for Colombia, ended with 39.14%. Centre-left ex-mayor of Bogota Gustavo Petro, running for the List of Decency coalition, won 25.09%. The Colombian National Police massacred between 8 and 16 people, and wounded more than 50, in the municipality of Tumaco, Narino on October 5. The attack was directed against protesting coca growing families demanding the government fulfil its commitments to voluntary eradication programs. Then, on October 8, the National Police attacked an international team sent to investigate the massacre. The police used tear gas and stun grenades to disperse representatives from the United Nations, the Organization of American States, and a journalist from the Colombian weekly, Semana. Members of the National Political Council of the Revolutionary Alternative Forces of the Commons (FARC) rejected the threats and violence that have claimed the lives of 25 people since signing peace accords with the government last November. “Since the signing of the peace agreement, five former combatants, nine militiamen and 11 relatives of members of the FARC have been murdered,” the group said in a statement on October 2. Colombia’s communist army, the Revolutionary Armed Forces of Colombia (FARC), relaunched itself as a political party on September 1 at a concert for “reconciliation and peace” in Bolivar Square, Bogota. The guerrilla movement, which fought one of the longest civil wars in history until agreeing to a ceasefire with the government last year, confirmed its new name the day before at the end of its five-day congress. It is now known as the Revolutionary Alternative Forces of the Commons, which will allow it to retain the FARC acronym. More than 100 community and social activists were assassinated in Colombia between January 1 and August 18 this year, according to a new report released by the Institute for Development and Peace Studies (Indepaz). The report showed that a further 194 activists received death threats during this same time. The report also found that 12 members of the Revolutionary Armed Forces of Colombia (FARC) were assassinated between April 14 and August 17, as were 11 relatives of FARC members. The Colombian government and the left-wing Revolutionary Armed Forces of Colombia (FARC) signed, for the second time, a peace agreement on November 24 that aims to end the country’s 52-year armed conflict. It comes after a previous peace deal was narrowly rejected in a popular vote in October. Hundreds of thousands of Colombians marched in silence in cities across the country holding candles and torches on October 5 in support of a peace deal that only just lost a plebiscite on October 2, Morning Star said. The huge marches came after the shock victory of the “No” vote in a plebiscite on whether to accept the peace deal negotiated between the government of Juan Manuel Santos and the left-wing Revolutionary Armed Forces of Colombia (FARC). Peace supporters react to the plebiscite result. The "No" vote was won by a half of a percentage point in a Colombian plebiscite on October 2 on a peace deal between the government and the left-wing Revolutionary Armed Forces of Colombia (FARC), which aims to end more than five decades of civil war. At its 10th National Guerrilla Conference from September 17 to 23, 51 delegates representing various Revolutionary Armed Forces of Colombia (FARC) factions across Colombia unanimously reaffirmed their support for the nation’s historic peace deal. The deal negotiated between FARC representatives and the Colombian government is aimed at ending the more than 50 years of violence that has wracked the South American nation. Photos of forcibly disappeared supporters of the Patriotic Union. Photo: EFE. 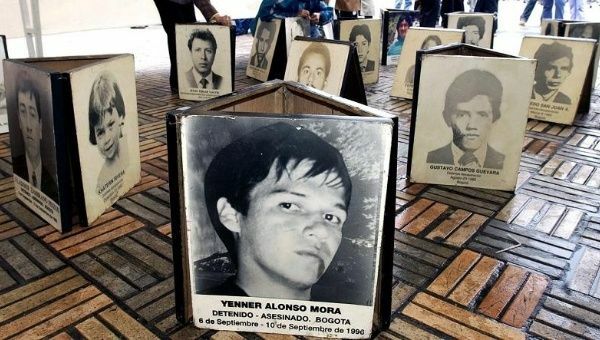 Colombian President Juan Manuel Santos acknowledged the state’s responsibility in the killing of thousands of members of a leftist political party three decades ago, TeleSUR English said on September 15. Santos pledged to prevent such assassinations again.